July brings sun and loads of fun activities and Bento, our new theme release. Just in time for summer, this sporty and fresh theme presents a colorful yet clean look, perfect for your business or event website. 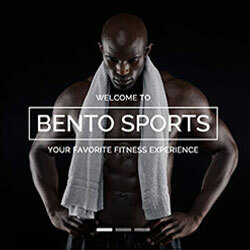 Bento theme features an optional overlay menu with a hamburger icon to toggle the navigation. The navbar can be fixed to the top of the browser window. The fixed navbar can then be placed on top of the specially created Header position, so it will overlay the content and turn transparent. This is great, if you're using a hero image or a teaser slideshow. We've also added a custom Slideset widget that comes in handy when displaying schedules, for example. Items can be filtered with a navigation that will be displayed in line with the widget/module title for a compact layout. Each module position can be styled individually. You can apply different backgrounds, padding and set each position to full height. As another feature, you can choose from three different background patterns that work well with all background colors. In addition to all this, Bento comes with 6 different style variations. An optional custom blog style arranges articles in a nice centered layout with a big featured image. And as a little gimmick we added the .tm-price helper class to create pricing tables with a grid.